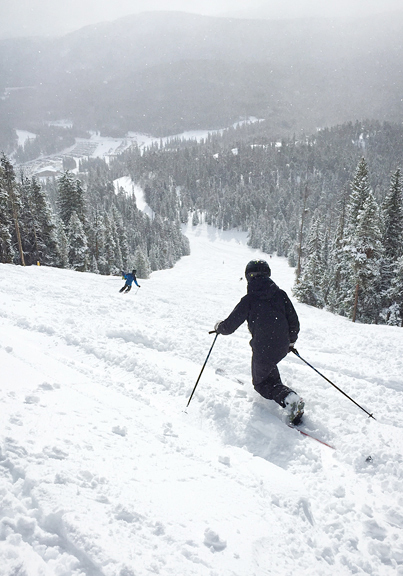 We are in the midst of a back and forth between snow and rain, cold and warm, clouds and sun. 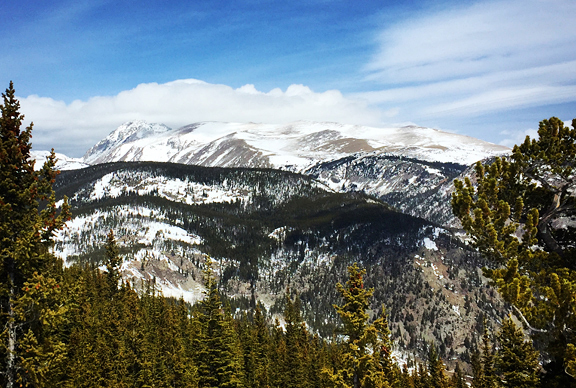 Our Rocky Mountain springtime is volatile and beautiful. It’s hard for me to decide which kind of weather I like best right now. But, I don’t have to choose because we get to sample all of it in a day or even in the span of a couple of hours. This year I feel I’m really embracing spring. Rather than finally getting around to our “spring cleaning” in September, we’ve been working on it since March. If you know me, you know that what I’m really excited about is the start of mushroom season. Ellen hypothesized that mushroom foragers inhale a good bit of mushroom spores which take over our brains and make us obsess over mushroom hunting. [I dismissed her idea with a laugh while secretly relaying this information to the overlord of our fungal hive mind.] 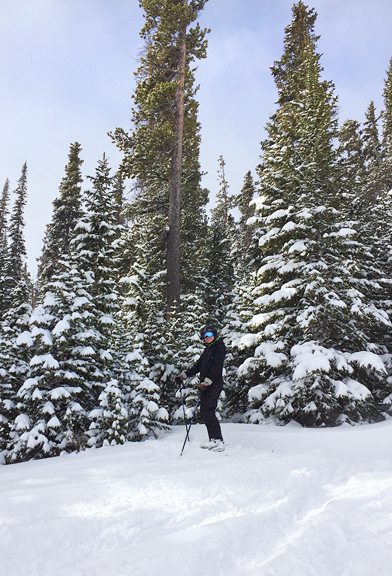 We are weeks away from the first mushrooms of the season in the Colorado high country, but that doesn’t keep me from monitoring mushroom activity around the country. It’s happening in Northern Georgia right now – morels. And soon it will be happening in more and more locations as we deep dive into spring. 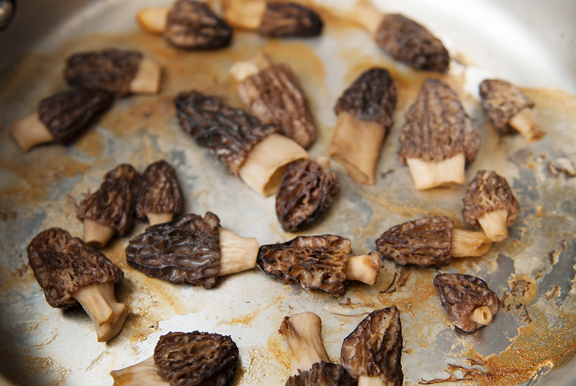 I made this dish last spring during my local morel season and cannot wait to make it again this year if I should be lucky enough to get my hands on more morels. I have found the easiest way to clean fresh morels is to hold each one caged loosely in your hand, and swish it around in a bath of cold water to dislodge any sediment, bugs, and other things that aren’t morels. Then I lay them on paper towels to dry for an hour or so. And don’t pour that morel bath water down the drain! I recommend pouring it out in your yard or someplace where morel-friendly trees grow because that water is full of morel spores (they are teeny tiny, but they’re there). 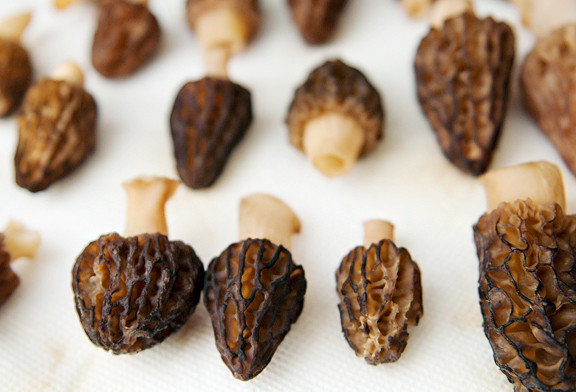 I can’t promise that morels will come up the following season, but it’s worth a try. 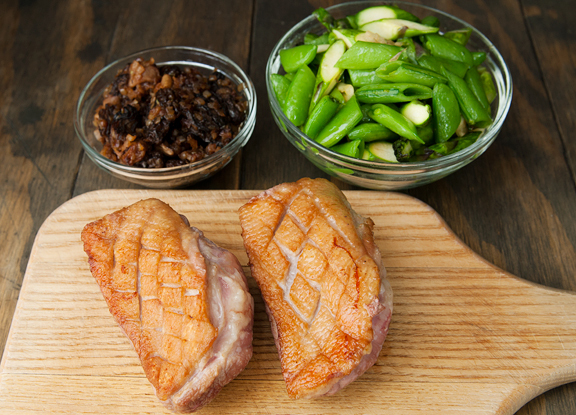 Prep the duck breasts by scoring the skin, and chop the rest of the vegetables. Because mushrooms have such high water content, I dry fry them first. That just means dropping them on a hot sauté pan and letting the heat extract a good bit of the moisture from the mushrooms. The excess water will boil off and the mushrooms will look wilted. 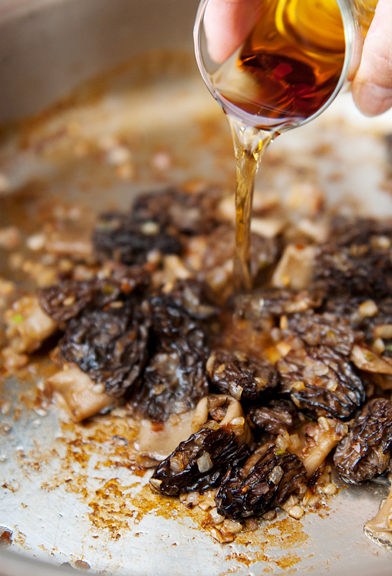 Remove the mushrooms from the pan and melt a pat of butter on the hot surface. No need to clean the pan because we want all of that mushroomy flavor to get soaked up. Sauté the shallots in the butter until the shallots are translucent, then add more butter and the morels, and add some brandy. 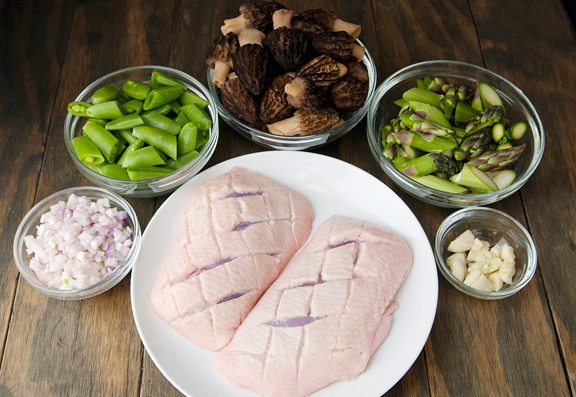 Set the morels aside and sauté the asparagus and snap peas with garlic and a little vegetable oil. You can use any vegetables you like here. I happen to love the crunch and bright spring green color of the vegetables as well as the sweetness of the snap peas. 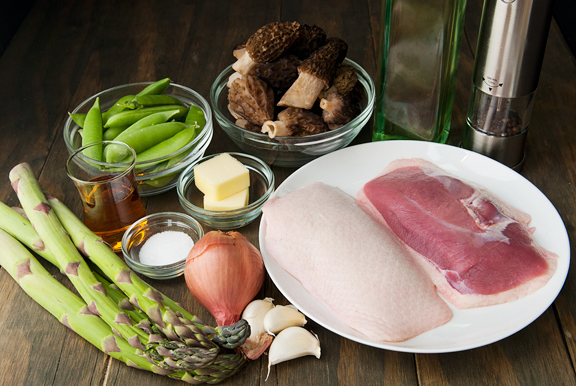 Morels are spring mushrooms, so spring vegetables work well with them. The last thing I do is cook the duck as that is the component I want to be hot (or warm) when served. It’s a quick pan sear and finish in the oven. I prepare duck so infrequently that I am always surprised and delighted at the amount of duck fat that is rendered from the skin of a single duck breast. Save that stuff. If you aren’t using it right away, put it in a jar and toss it in the freezer. If you don’t have a use for it, send me an email. I happened to have a couple of potatoes lying around and decided to fry them up in the precious duck fat and add them to the dish. The components of this plate are all fairly straightforward to cook, but the ensemble is a love letter to your mouth. I can’t wait to make it again! Preheat oven to 350°F. Score the duck skin in a criss-cross pattern with a 1-inch grid. Lightly salt and pepper both sides of the duck breasts. Set aside. Dry fry the mushrooms in a frying pan over medium high heat. The morels will give up their liquid. Let the liquid boil off. Remove the mushrooms from the pan to a bowl. Melt a tablespoon of butter in the same pan and sauté the shallots until they turn translucent. 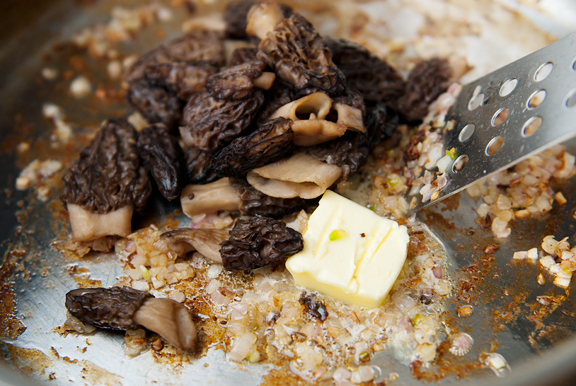 Add the second tablespoon of butter and the dry fried morels. Sauté until the mushrooms are lightly seared in the butter. Add the brandy and simmer until liquid is reduced by half. Season with salt and pepper. Remove from heat and set aside. 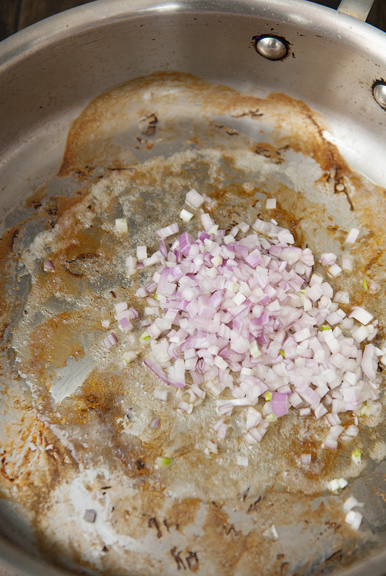 In a clean sauté pan or skillet, heat a tablespoon of vegetable oil over medium high heat. Add the garlic and stir until fragrant. 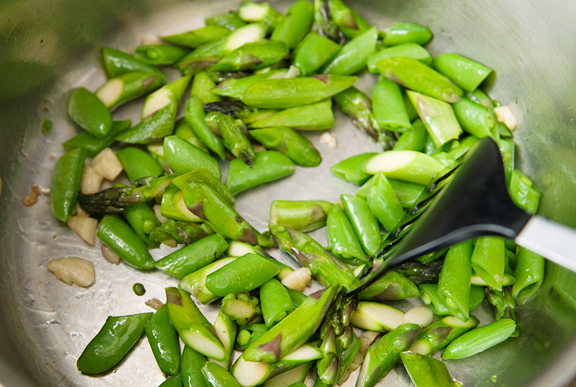 Sauté the asparagus and snap peas in the pan until cooked, but still bright green. Season with salt. Remove from heat and set aside. Wipe down the sauté pan or skillet that you used to cook the asparagus and snap peas. Set the pan on high heat. 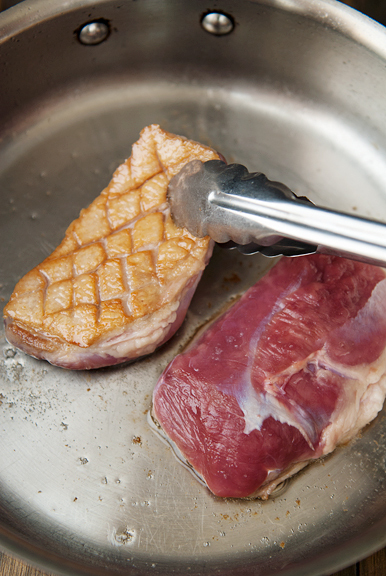 When the surface is hot, place the duck breasts skin-side down in the pan. Reduce the heat to medium. Baste the tops of the duck with the duck fat. 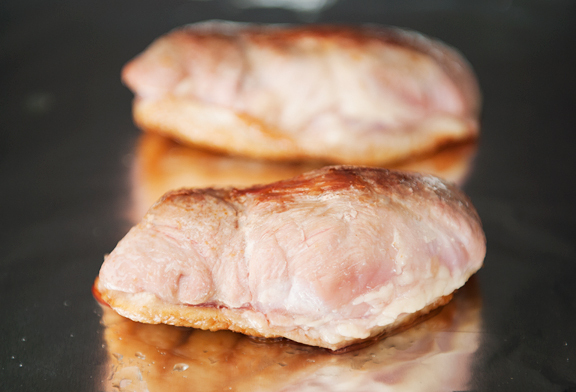 When the skin has crisped and browned, flip the breasts over and cook for another minute until seared. 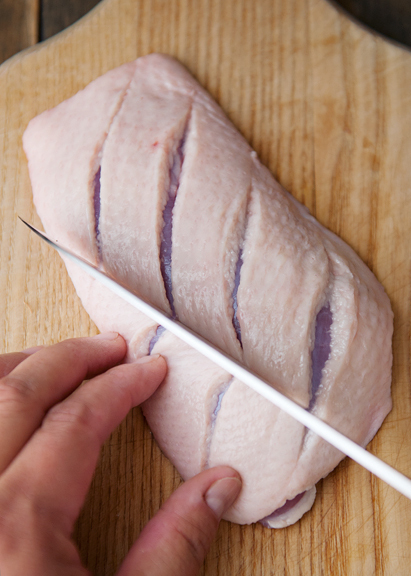 Turn off the heat and transfer the duck breasts on a baking sheet, skin-side down. Finish the duck in the oven for 4 minutes (medium rare should register 135°F). Remove from oven and let the duck rest for a few minutes before slicing on a diagonal against the grain. 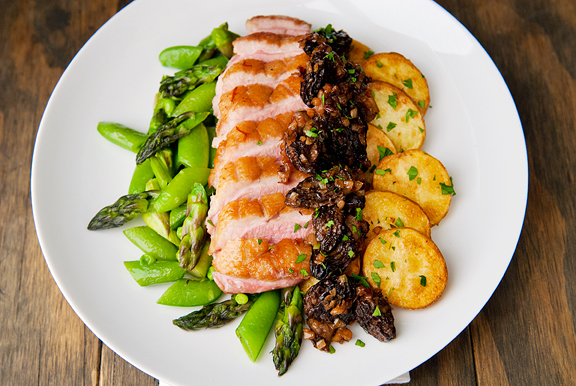 Serve the duck with the mushrooms and asparagus. Serves 2. 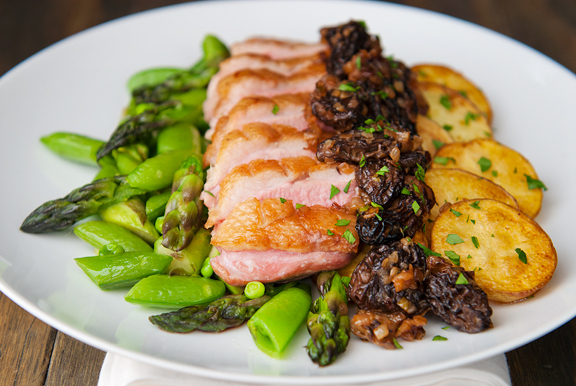 One of my favourite sous vide dishes are duck breasts and duck legs, separately of course. After de-boning I roast the rest of the duck and then make an amazing stock, but really limit the salt so the resulting fat doesn’t end up too salty. Using a bit of that fat for the legs gets you a confit, 12 hours, that can wait several days to a week before reheating. The breasts take only 2 hours but I want to change something with those as the final searing doesn’t render the skin enough, to a crispy edible delicacy I imagine. I will attempt removing it and rendering it more somehow, fun to experiment. hungry dog – You ARE lucky because I don’t have any duck right now! I also don’t have morels… yet? :) It’s probably fine to substitute other delicious mushrooms!